Outdoor water features are a great feng shui element that can activate wealth sectors and also disperse negative energy. Building an outside water fountain or other water feature requires choosing a location, such as a garden or backyard. Feng shui principles dictate a round- or oval-shaped water feature is the ideal shape. 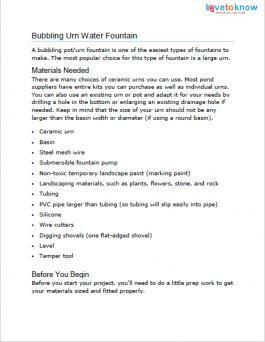 The best way to build an outdoor water feature using feng shui guidelines is to choose either the east or southeast sector of your yard. Until 2024, the southwest sector is especially good for an outdoor water feature to activate wealth energy. 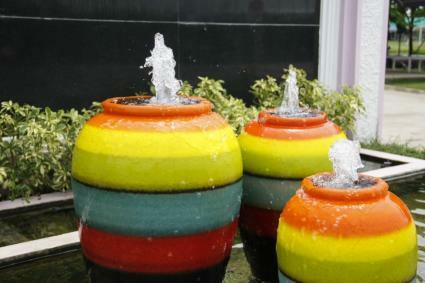 A bubbling pot/urn fountain is one of the easiest types of fountains to make. The most popular choice for this type of fountain is a large urn. There are many choices of ceramic urns you can use. Most pond suppliers have entire kits you can purchase as well as individual urns. You can also use an existing urn or pot and adapt it for your needs by drilling a hole in the bottom or enlarging an existing drainage hole if needed. Keep in mind that the size of your urn should not be any larger than the basin width or diameter (if using a round basin). Before you start your project, you'll need to do a little prep work to get your materials sized and fitted properly. The selection of a fountain pump is determined by the size of the urn and distance to the pump. The distance that the water must travel up to the urn is referred to as maximum lift. Calculate gallons per hour (GPH) by multiplying the tube diameter by 100. This is the GPH rating needed. Add the height of the fountain and the distance to the pump together to get the maximum head height rating (maximum lift). For best results multiply this figure by 1.5 and use this for your maximum lift figure when purchasing a submersible pump. On the pump packaging find the GPH and maximum lift that fit your requirements. The PVC pipe guides the tubing to the top of the urn. If you purchase a fountain urn, this pipe will already be in place. If you're turning an urn into a fountain, then you need to provide this guide pipe for the tubing. Measure the height of you urn and the drainage hole diameter. Select a PVC piping that is larger than tubing. Insert PVC piping into drainage hole (if need to enlarge, use a hole bit and drill a larger hole). Make sure the pipe is slightly below the urn rim height. The tubing will extend about 1/2" beyond the pipe end. Seal piping at bottom of urn with silicone sealant and allow to dry according to manufacturer's instructions. Before starting, make sure tubing will slip easily inside the PVC pipe. Measure the height of your urn allowing an extra 2"-3". Measure the depth of your basin and add to the urn measurement. Add 5"-10" to allow for pump placement in the basin. Tubing will be inserted into bottom pipe and thread up to top of urn. Use silicone to seal the tubing and hole at the top and bottom of urn. Allow for drying time before continuing. This type of fountain design is self-contained and depending on the reservoir size you choose, maintenance, such as refilling with water will be minimum. Before you began gathering supplies, you need to decide on the type of reservoir you wish to use. You can purchase a basin with a grate or make your own. Keep in mind that the size of the reservoir will determine how often you need to refill it with water. A mini-vase reservoir will hold a few gallons whereas a larger basin can hold as much as 75 gallons of water. This type of kit that doesn't include the pump and tubing will cost between $130 to $400+, depending on size. However, the cheapest way to create a basin and grate is to make it yourself. Select a large tub. This can be round, rectangle or square. Plastic is the best and cheapest material for this. You will then use a steel mesh over the basin. The mesh squares need to be small enough to prevent debris and rocks from falling into the basin, but large enough to allow easy water flow. The mesh should fit beyond the edges of the basin to ensure complete coverage and allow for any slight slippage. 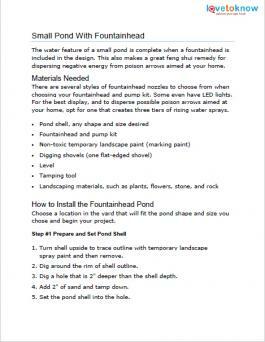 Once you've selected the location for your fountain, it's time to install it. Place the basin onto the ground in the spot you want for your fountain. Outline the basin by spraying marking paint onto the ground. Dig a hole for the basin reservoir using the marking paint outline. Use a flat edged shovel to neaten up the hole (square or rectangle shaped basin). The basin hole should be deep enough so that the basin rim is even with the ground. Tamp down the inside of the hole and if needed use leveling sand. Back-fill around the basin and tamp down loose dirt. Use level to be sure the basin is set properly. Place the pump into the basin. Attach tubing from the urn to the pump. Add the steel mesh over the basin. Using wire cutters, snip the center of the mesh enough for the tubing and electrical cord to pass through. Bend cut ends into mesh to avoid ripping through pump tubing. Cut a small square section in the mesh to allow easy access to the pump. Cut another section of wire mesh a bit larger than the pump access cutout and simply lay it on top to prevent debris from getting inside. Secure the steel mesh over basin opening by place a couple of rocks on top (save remainder to use later). Move electrical cord onto the ground beside the basin. Cut tubing so that it's flush with urn opening. Fill basin with water, taking care not to displace pump or mesh. Plug in pump to test your work. Place a variety of rock sizes on top of the wire mesh around the urn. Be sure the stones are large enough not to fall through mesh squares. Landscape around the urn with water-loving plants. Camouflage the electrical cord with rocks, plantings, and mulch. Replace evaporated water as necessary. Enjoy the sound of water cascading down the urn and the beautiful aesthetic addition to your garden or patio area. The water feature of a small pond is complete when a fountainhead is included in the design. This also makes a great feng shui remedy for dispersing negative energy from poison arrows aimed at your home. There are several styles of fountainhead nozzles to choose from when choosing your fountainhead and pump kit. Some even have LED lights. For the best display, and to disperse possible poison arrows aimed at your home, opt for one that creates three tiers of rising water sprays. Choose a location in the yard that will fit the pond shape and size you chose and begin your project. Turn shell upside to trace outline with temporary landscape spray paint and then remove. Dig around the rim of shell outline. Dig a hole that is 2" deeper than the shell depth. Add 2" of sand and tamp down. Set the pond shell into the hole. The pond shell needs to be fitted into the hole by weighting it down. The easiest way is to step into it and walk around. Once you feel the shell is sufficiently settled into the sand underneath it, stepped out of the shell. Check that most of the shell rim is even with the ground. Back-fill around the pond shell with loose soil or sand and tamp down to prevent shell from slipping. Makes sure pond is level by using the leveler to test rims. If necessary, add more sand underneath shell until level. Place two rocks inside the shell to hold it in place. Be careful not to damage shell. Fill shell half-way full with water. Check to see that shell remains level. Adjust leveling by adding metal washers underneath shell. Set the pump in the deepest part of the pond shell, centering it. Add the fountainhead and test so you can adjust the spray height. Finish filling the pond with water. Add landscaping stones and plants (cover electrical cord with mulch, stones, and plants. Building a water fountain, especially an outside water feature can enhance your feng shui design and attract wealth luck. 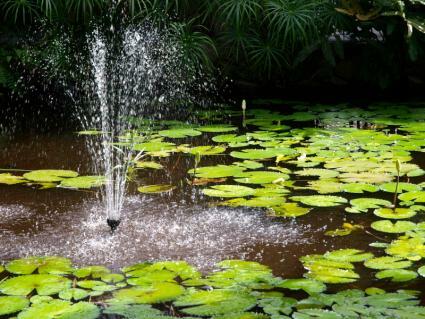 You may prefer a larger pond suitable for koi or other type of water landscaping. While the backyard is a great place for a water feature, you can also place on in the front of your home. Patio water wall: Marie with The Interior Frugalista presents a remarkably easy to follow project. Water garden or fish pond: Whether you're interested in a water garden or a koi pond, The Water Garden project is what you need. Waterfall and stream: You can create a faux stream, complete with a waterfall, and have it all! Incorporating the water element as part of your outdoor yard design is more than a feng shui application. It has real aesthetic value that adds dimension to your garden or patio design.